There's a reason many of us live in the Twin Ports. We love Lake Superior and the streams that flow into it! We think that you'll love the various views of Lake Superior we found, provided by the many webcams pointed at it from around the Twin Ports. Please let us know if you find others that we can add to our site! Enjoy the view of the lake! Canal Cam: A view of the Shipping Canal from the end of Canal Park, atop the Lake Superior Maritime Visitor Center (See Bridge Cam for view in other direction). Bridge Cam: From atop the Lake Superior Maritime Visitor Center in Duluth, this camera is pointed right at Duluth's Aerial Lift Bridge (See Canal Cam for view in other direction). Great Lakes Aquarium Cam: Watch the weather, birds and boats on Great Lakes Aquarium Harbor Cam. 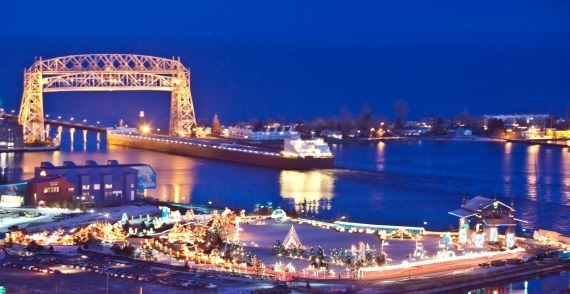 Pier B Cam: Located at Pier B next to Bayfront Park, you get a close up view of the Aerial Lift Bridge and the Duluth Shipping Canal. Harbor Cam: A view of the Lift Bridge as seen from the harbor. Bayfront Cam: This camera offers a view of Lake Superior from the Duluth Hillside, and overlooks Bayfront Park. South Pier Inn: Views of the lift bridge and the harbor from the South Pier Inn. Glensheen Cam: A view of Lake Superior off the historic Glensheen dock. Allete Cam: A view of Lake Superior from the Allete building in downtown Duluth. Beach Cam - Solglimt: Watch Lake Superior as seen from the Park Point side of the Lift Bridge. Beach House Cam: Located at the end of Park Point, near the airport, this beach cam offers views of Lake Superior from the Park Point Beach House. Duluth News Tribune Cam: A live feed of Lake Superior and the Lift Bridge as seen from the harbor. Lakewalk Cam: A view of Lake Superior, from the Inn on Lake Superior, overlooking the Lakewalk in Canal Park. VisitDuluth Cam: A view of the lift bridge from Downtown Duluth. Please note that some webcams may not be active at all times, are limited to a specific type of browser, or may require the use of Flash or Java.